There is renewed concern about the issue of “selective exposure” – the possibility people use the internet to tailor the information they receive to their beliefs or interests. The ominous implications of this phenomenon are obvious. In an effective democracy, it is important that people consider a range of arguments, including those that challenge their viewpoint. If people screen out information that disputes their beliefs, then the chances for true democratic debate will be stunted. Moreover, if people develop habits that continually reinforced their views and shun opposing views, they might become more rigid and perhaps extremist. That could lead to the kind polarization that would make deliberation and consensus impossible. A generation of research seemed to settle the question. By the late 1960s there was a consensus among scholars that there was not much evidence that selective exposure was occurring. The conclusion drawn at the time was that people do not demonstrate a great preference for supportive information, nor do they avoid information that challenges their beliefs. Researchers observed that people may exhibit a slight tendency to encounter information supportive of their own views, but this does not appear to be the product of a psychological preference. Rather, it results from information screening that is based on factors such as education levels that are not related to people’s ideological views. Yet, now the question has arisen again. The explosive growth of the internet has renewed interest in selective exposure. New communication technologies allow people to customize the information they receive in even more powerful ways than were possible in the age of mass media. People could tailor their information inputs in a way that would reinforce even slight preferences and have a significant effect on their overall consumption of news. By the late 1990s, many scholars and internet analysts had written about this possibility. The most common concern centered on the risk of fragmentation and balkanization. Some feared that people would use the control afforded by new information technologies to reduce dramatically their exposure to views and information that did not fit their worldview. The internet plays a growing role in people’s news gathering. The role of the internet as a news source has been growing both for general news and for news about politics and public affairs. 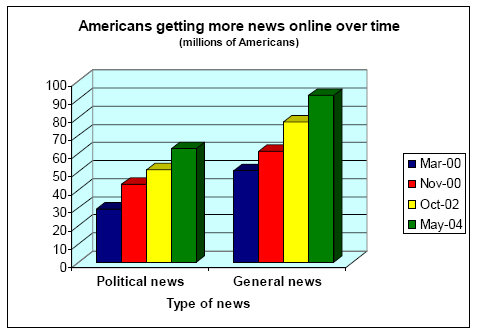 In March 2000, 30 million Americans had gotten news about politics using the internet, and 51 million had gotten news of any kind. By the middle of 2004, these numbers had grown to 63 million and 92 million respectively. The internet is now an important, but largely supplementary, source of news for people. This role may grow as the penetration of broadband internet connections at home grows and the internet goes from being a supplementary to primary source of news for many Americans. Moreover, the internet’s character as a news source may also be very different from traditional media. The internet – and high speed connections especially – may allow people to filter out information that they would prefer not to see. At the same time, they might seek out only that information which supports their existing points of view. This puts the internet potentially in conflict with a key value in a democracy – a richly informed public that has weighed the different sides of issues and thereby makes the best informed electoral decisions. With widespread concern that the nation is increasingly polarized, the possibility of a vicious cycle presents itself. People, in an environment of polarization that perhaps already encourages them to seek out information that reinforces and avoid information that challenges their existing views, may use the internet to accelerate that trend. That would reduce people’s ability to find political common ground, and increase the risk of extremist beliefs and radical action. The internet-driven “daily me” might further degrade the climate of public discourse. There is another possibility, though. Running counter to the potential of an internet-aided information balkanization is the notion that the internet may improve the quality of democratic deliberation as people have a new and easy-to-use resource to become informed about civic issues. To explore these cross currents, the Pew Internet & American Life Project and the University of Michigan School of Information conducted a survey in June 2004 to examine people’s newsgathering patterns in the election season. The survey sought to examine the degree to which individuals encounter information that is at odds with their positions on issues or candidates. To the extent that healthy democratic discourse relies on collisions – people (actively or not) being exposed to information that informs and challenges their views, with the result being better-informed electoral choices – our purpose is to see whether the internet contributes to, or inhibits, such collisions.